Two magazines published at the beginning of the 20th century provided reliable, credible trapping information at a time when such knowledge was more typically guarded as a valuable secret. The magazines were called HUNTER-TRADER-TRAPPER and The North American Trapper. Arthur Robert Harding’s H-T-T was the first, initially published October 1900. Harding also produced a weekly publication called Camp & Trail, which ran for about four years before being consolidated with H-T-T. And, of course, Harding founded this magazine in 1925. A.R. Harding was born July 17, 1871 and began trapping on the family farm near Kyger, Ohio, at the age of nine. By 1884, he was buying fur from other young trappers in the neighborhood, and when he was 20 years old, he took a job as a fur buyer for L. Frank and Sons of Zanesville, Ohio. By 1897, he was self-employed as a fur buyer and was also publishing a weekly county newspaper called The Gallia Times, located in Gallipolis, Ohio. This publishing experience led directly to H-T-T, which also was first published in Gallipolis. The first issue was 5-1/4 by 9 inches in size, had 24 pages, and a few thousand copies were mailed to subscribers in Ohio and surrounding states. By 1903, the magazine had grown considerably, and according to an account published in Richard Gerstell’s The Steel Trap in North America, Pierrepont Noyes of the Oneida Community attempted to buy a half-interest. But Harding would have none of it. So, the next year, Oneida Community began publishing its own monthly magazine, called The North American Trapper. The first issue was June 1904. Noyes offered traps to entice new subscribers, and from the beginning, the magazine grew. Rather than compete, in 1905, Harding and Noyes agreed to what amounted to a combination of the two publications in a 50/50 stock proposition that cost Oneida $8,000. August 1905, The North American Trapper published its last issue before being absorbed into H-T-T. Also in 1905, Harding moved his offices from Gallipolis to Columbus, Ohio, for easier access to better printing and mailing facilities. By then, H-T-T had grown to 80 pages with nearly 10,000 subscribers, and by July 1909, nearly 50,000 copies were being printed and sold each month. In 1912, Harding bought back Noyes’ interest in H-T-T, ending a joint venture that apparently benefited both companies. Then, in 1914, Harding sold H-T-T outright to Walter R. Herr and Fred Herr of Columbus, Ohio. The stated reason for the sale was Harding’s failing health, though it was never explained in any detail. By 1923, H-T-T boasted 120 pages, and apparently back in better health, Harding attempted to buy it back. But the Herrs would not sell, so in August 1925, Harding purchased Fur News and Outdoor World, changed the name to FUR-FISH-GAME, and went into direct competition with his former title. The last issue of H-T-T as a distinct entity was June 1938. The name was then changed to Hunter-Trader-Trapper/OUTDOORSMAN, and I believe the name was shortened to Outdoorsman in 1940. A set of H-T-T, October 1900 through June 1938, encompasses a total of 453 issues. 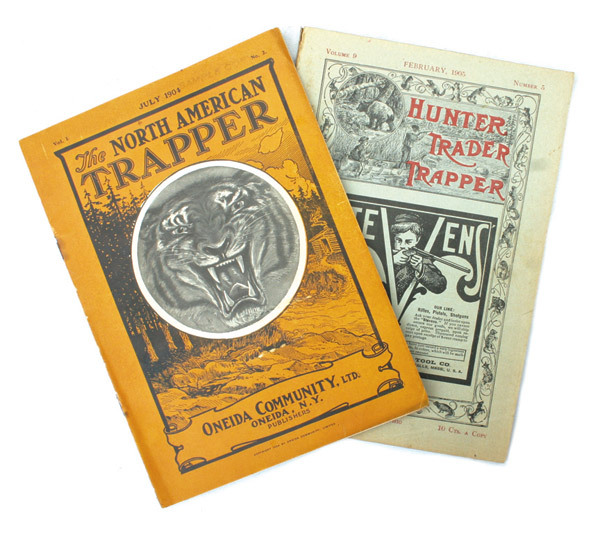 Only 15 issues of The North American Trapper were ever published. I would like to thank Ed Myers, Orville Lawrence, Rich Harding, and Richard Gerstell for their written help.